Girls in Gis would not be the organization it is today if not for all the Girls in Gis working hard behind the scenes. There is so much that goes on behind the scenes before an event even starts and so much to do to keep the gears greased. Among one of the most dedicated and spirited of the girls helping to make sure Girls in Gis is full steam ahead is Natalie DiNingrat. 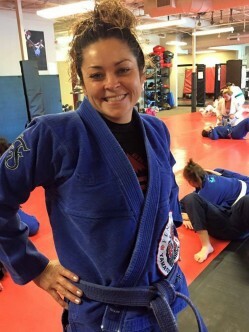 Natalie is among the new wave of females coming to BJJ that began by watching her daughter in class. Her daughter started about 6 months before her and her husband. She was inspired by seeing a small girl be so strong and it looked like so much fun. With the encouragement of the team she gave it a try and she loved it. 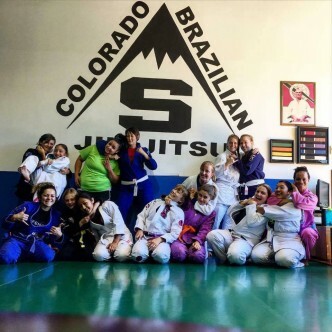 Natalie has been participating in Girls in Gis events just shortly after her Jiu-Jitsu journey began in 2013. Natalie has had Girls in Gis as a core part of her entire journey thus far and it only seemed fitting that she join the team starting in 2014. She has since done nothing other than prove to be a valuable asset to the team and continues to bring more and more to the table. 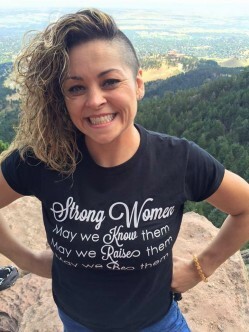 She was brought on as a Girls in Gis ambassador for the Colorado chapter. Shortly after Shama Ko fell ill, being the rock star Natalie is, she immediately stepped up and offered her assistance on a more wide spread level. Having a strong background in administrative assistance, customer service and being an all around enthusiastic spirit, she has brought nothing but light and laughter to the team. All of those amazing posts you see on Facebook, well that is because of Natalie’s commitment to keep the humor, information and love going. That is just one of the many roles she has taken on in the organization. The future is even more bright because of Natalie’s contributions. When Natalie is not wearing a gi which is rare, Natalie is running her business Faces By Sugar. She is an extremely talented face painter and body artist. She trains most every day and is almost always in her gi. She is married with children. Her husband Omar, daughter Elise and son Xavier all train together so most of her days are spent at the gym. She is also a coach at her academy and coordinate events for her academy association in Colorado. Why do you think it’s important for females to train? And train with each other? Nothing is more powerful then believing in your self. Self defense is very empowering. Jiu jitsu has reinforced my own self worth. Knowing I can survive a fight reminds me that I am worth fighting for. Jiu jitsu teaches me my life is worth fighting for. At the end of the day, everyone can benefit from training. It not only works your body it works your mind & spirit. Jiu Jitsu helps you to be strong physically and mentally. Training with women is unique and valuable. Women can benefit from training with someone that understands what it is to be a woman. The women I train with inspire me and I inspire them. We can support each other to be the best we can be. As women we must rely on being technical in order to be effective. Especially when you are getting smashed! When did you attend your first event? What was your impression? My first event was August 4, 2013 and it was AMAZING!!!! I have never felt so much passion and love from a group of women. We were all there having a great time learning technique. I knew at that moment that i would always be part of Girls in Gis! Why did you want to get involved in the organization? I have never felt so much self worth & so much desire to share my jiu jitsu journey. There is no other feeling in the world like when you are training. When you are able to be inspired and Inspire others your heart opens up to the most beautiful feelings. I wanted to be involved because my life was changed forever the day I started training. The fist time I rolled was the most exhilarating experience I cried, I laughed, I had so many emotions I knew in my heart that there was no stopping!!! I love my girls in gis!!! What kind of an impact have you seen GIG have on the Colorado community? I have seen us come together as sisters. We encourage each other and help support each other. I have had people say wow the women community here in colorado is awesome you all know each other. At tournament we all watch and support each other. We attend each other’s women classes and open mats. Many of us hang out out together outside of Jiujitsu … We are a community and we just don’t stick with our team members we bond and break down walls across academies. Where do you see the future of female BJJ going? What would you like to see happen? There is no place to go but forward! I would love to see more women and girls train. What kind of an impact do you want to make on the community? I want the community to know that I love and care and I will be here to help with anything that is needed. I want to be the best I can be. I believe we lead by example. 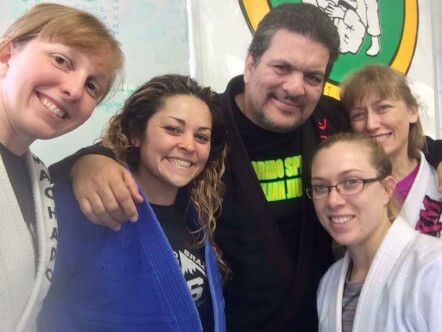 i want to help support as many women as I can through jiu jitsu.